For the economic development in the northern region including Nilphamari, speakers demanded gas supply to Uttora EPZ and completion of Tista barrage soon. Mass media and business leaders said it while speaking in a dialogue on local economic and trade and business development held at Municipality auditorium in Nilphamari today. With the support of European Union, mass communication oriented development organization CCD and EJ Net-Nilphamari organized this dialogue. 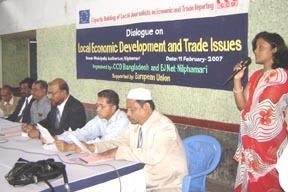 Senior Faculty Member of Rajshahi Krishi Unnayan Bank A B Siddique moderated the dialogue. In the dialogue, speakers said, extension of Syedpur BISCIC industrial area, set-up of Chilahati land port, developing the cargo service in Sayedpur Airport and its upgrading into an international airport are must for the agricultural, industrial and economic development in this region. District Correspondent of the daily Sangbad and ATN Bangla M R Ratan Sarkar and District Correspondent of Bangladesh Television M. Nurul Islam presented two reports respectively on “Problems and Potential of Business, Trade and Economic Development in Nilphamari”and “Uttora EPZ: Problems and Potentials” while Convenor of EJ Net-Nilphamari Aminul Hoque was in the chair. Joint-Convenor of EJ Net Nilphamari Israt Jahan Pallbi and Project Coordinator of CCD A H M Abdul Hai presented welcome address. Among others, Executive Member of Nilphamari Chamber of Commerce and Industries and President of BFA, Nilphamari Md Abdul Wahed, President of Chilahati Land Port Implementation Committee Abu Musa Mahmudul Hoque, President of Sayadpur Chamber of Commerce Md Idris Ali, President of Sayadpur Idustry Owners Association Shaokat Chowdhury, Joint Convenor of EJ Net Nilphamari Mohammad Abdullah, Manager of Janata Bank M A Halim, Manager of RAKUB Tohidul Islam, President of Hotel Owners Association Ali Ahmed and Lecturer of Nilphamari Govt. Women’s College Md Daimul Islam took part in the discussion.